Thanksgiving is just over one week away and I’m sure many of you are thinking about your dinner menu. Dessert is always a part of Thanksgiving dinner and most often, it’s pumpkin pie. 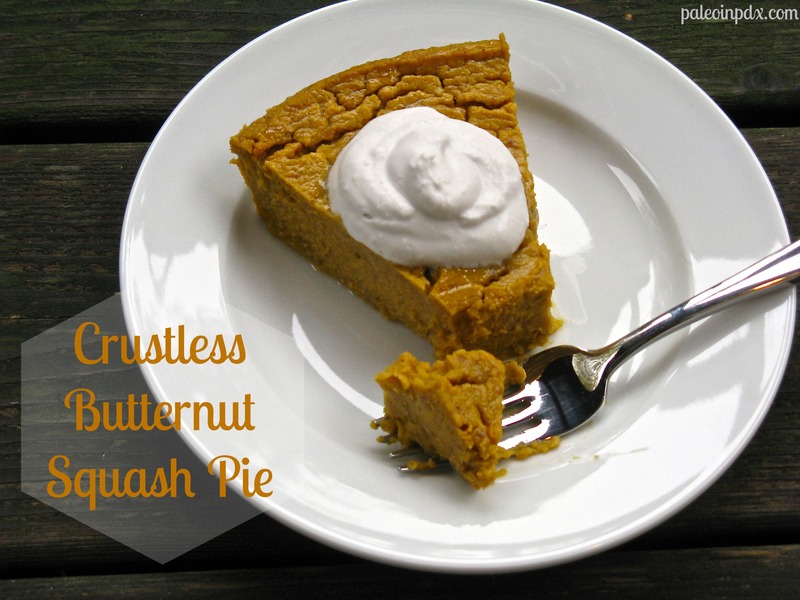 As much as I love pumpkin pie, I think I adore butternut squash pie even more. It yields a bit more flavor and is just as easy to prepare. In this recipe, however, there is no crust and the pie forms a little bit of its own crust. Now, I have nothing against crust and appreciate a good (grain-free) one, but when it comes to pumpkin pie (or butternut squash), I’m all about the filling! If you’re set on having it though, you can use this recipe with a crust. I think a nut crust with ground pecans and hazelnuts would be especially delicious. UPDATE: watch the replay of me making this recipe on KATU Afternoon Live on November 15, 2017. Visit HERE to watch! Preheat the oven to 350 degrees. Cut the butternut squash (about a 2-2.5 lb squash) in half lengthwise and scoop out the seeds. Place flesh side down on a baking pan and add about 1/4-inch of water or so. Bake for 60 minutes in the oven or until flesh is soft. Allow to cool and then scoop the flesh out of the skin and place into a food processor. Process until completely smooth — you don’t want any lumps! Then, place in a fine mesh colander/strainer (line with cheesecloth if it’s not fine enough) and drain overnight in the refrigerator (obviously, you’ll place a bowl underneath the strainer to catch the liquid). Ta-da, beautiful and perfect squash puree! Preheat oven to 350 degrees. Grease a 9-inch pie dish with a little butter and set aside. In a large mixing bowl or the bowl of a stand mixer, add all the ingredients. Process until smooth with a hand mixer or the stand mixer. Scrape down sides of the bowl with a spatula and process again. Once smooth and blended, pour the mixture into the greased pie dish. Bake for 50-60 minutes in the preheated oven. Once done, allow to cool completely before serving. Cut into desired size slices and serve with homemade coconut milk whipped cream, if desired. Or, if tolerated, serve with homemade dairy-based whipped cream. Store any leftover pie in the refrigerator. Um YUM. I just sent this to my Mom and asked her if we can make it when I am home next week! I don’t bake and I am going to stay with them for 10 days so I don’t want to make anything for at home. That looks SO GOOD though. You are so creative! Awesome, I hope you two do make it together! It is so delicious and hopefully, you’ll think so too 😉 Thanks for your kind words, lady! I love the way the cracks look too — very rustic! 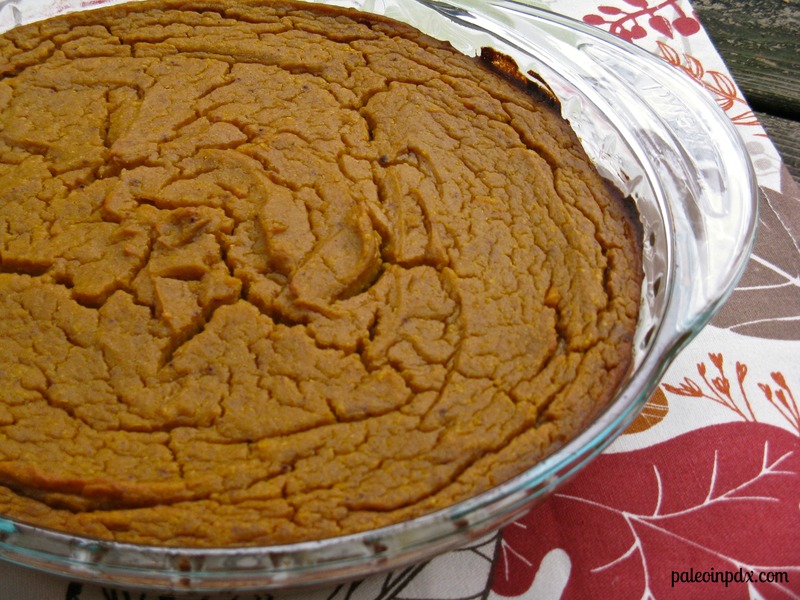 I’m sure buttercup squash would make a great pie and yes, it is less watery, so you probably can skip the draining step. Let me know how it turns out! I may have to try it with buttercup as well. Thanksgiving or not, you should make it! It’s spectacular and eat it to celebrate life! Step aside pumpkin..there’s a new pie in town!! I made this last night and just had some for breakfast. Oh sooo good. I had about 1 cup of cooked buttercup squash so I halved the recipe and baked it in a cute little tart pan. I didn’t drain the buttercup–it seemed dry enough and it all worked out perfectly. I’ll make a bigger one next week–love this recipe!! Love this, Paula! Your little pie must have been so cute and I actually love the idea of a baby pie. I’m going to have to try it with buttercup — it is my favorite afterall. It’s great that you can skip the draining step too — now waiting overnight! Hopefully I can find a buttercup squash right now. I’m noticing that they’re getting harder to find in the store, but others are still readily available. Yum!!! I’ve been planning on making a butternut squash pie as well. So glad you posted a recipe. Looks divine. Can’t wait to see your recipe! I’m sure it will be delicious. Thanks for your kind words, Alissa! Its not clear if coconut cream should be part of the mix in the bowl, or its only for the whipped cream at the end? It says in step #2, add ALL the ingredients. Thanks,just making sure! I’ll let you know how it comes out. Glad you like it! Thanks, Virginia! This pie turned out wonderfully! Thanks for the delicious recipe!